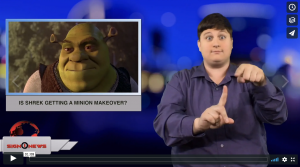 Is Shrek getting a Minion makeover? Variety magazine reports the Shrek franchise is getting a reboot overseen by Chris Meledandri. Universal’s parent company now also owns DreamWorks animation, which made the Shrek movies, and it want some fresh storylines for the big green ogre. Meledandri said tells Variety he hopes to bring back voice stars Mike Myers and Eddie Murphy for the reboot.